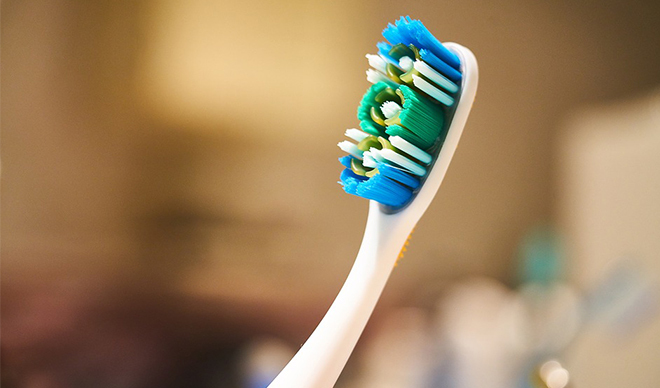 The American Dental Association (ADA) recommends we replace our toothbrushes every 3-4 months. Ideally, it should be every 2-3 months. This is because the bristles on your brush become frayed and soften, losing their effectiveness in thoroughly cleaning your teeth. Bacteria can also build up in old toothbrushes, especially after you’ve had a bout of illness. This bacteria can be harmful to your teeth and your body, so for the best oral hygiene, you should change your toothbrush regularly. Whiten wall or floor tiles– by squeezing a pea-sized amount of toothpaste onto your brush, you can scrub white floor or wall tiles and have them gleaming again. This works especially well if the tiles are textured. You can also do this for the grout grime that builds up in between. Painting– if you like art and experimenting with new ways to create effects, then you could try using your old toothbrush to splatter paint or make interesting patterns, just like a normal paint brush. Cleaning your taps– in both the bathroom and kitchen. Wet the area with a little white vinegar and then use your toothbrush to get into the hard to reach spots and dislodge the grime. Clean dirty vegetables– toothbrushes are especially good at removing soil off vegetables – anything from carrots, potatoes, corn, and yams. Scrubbing marks off the wall– the bristles of a toothbrush are gentle enough that they wont further mark your wall, but tough enough to get rid of those pesky marks. – especially handy if you like to work in the garden. Just soak your hands in soapy water for a few minutes then brush away the dirt. Apply hair dye– whilst you couldn’t use a toothbrush to dye your whole head of hair, it can be useful when you need a quick touch-up, or if you want to add some coloured highlights. Simply take a strand of hair, put the dye on the brush and comb through. Brush your eyebrows or moustache– first you’ll need to sterilise the toothbrush and give it a thorough wash. Rather than buying expensive grooming products, you can tame your facial hair with this inexpensive solution. Exfoliate your lips– combine a little sugar and coconut oil in a bowl and apply to your lips. Then slowly and gently brush your lips in circular motions until dead skin is removed. Wash off and apply lip balm for supple, soft lips. Cleaning muddy shoe soles- use your toothbrush on all shoe types to loosen hardened mud on the sole. It makes cleaning work boots or trainers much easier. ⟵Should I Pay For Private Dental Care in London?